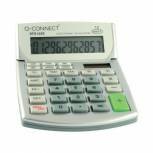 Q-Connect Semi-Desktop Calculator 12-Digit KF01605 Pack of 1 Q Connect Dual Powered 10 Digit Calculator with extra large easy to read adjustable display, 4 memory keys, battery back-up and auto power off. Dimensions - 138x103x31mm. 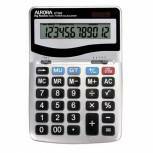 Aurora Grey 8-Digit Semi-Desk Calculator DB453B Pack of 1 Aurora 8 Digit Semi-Desktop Dual Powered Calculator DB453B. 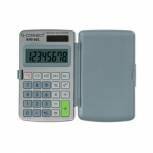 Ideal for general use, features include fixed angle display for easy viewing, large keys, 3 memory keys, mark up/down key and auto power off. Dimensions - 102x133x25mm. 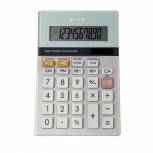 Aurora White/Blue 8-Digit Semi-Desk Calculator DT210 Pack of 1 Dual powered desktop calculator with large 8 digit fixed angle display and spacious keypad. 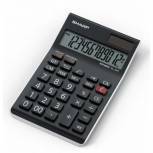 Features include: 4 key memory, constants: addition, division, multiplication and subtraction, percentage and square root keys and +/- change sign key. 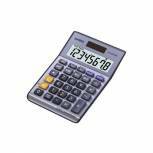 Q-Connect Large Table Top 12 Digit Calculator Grey KF15758 Pack of 1 12-digit calculator. Reliable and hardwearing. VAT and tax functions. Dual power options: solar and battery. Colour: grey. 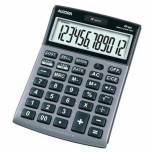 Aurora Silver/Grey 12-Digit Semi-Desk Calculator DT398 Pack of 1 Aurora Semi-Desktop Calculator - DT398. 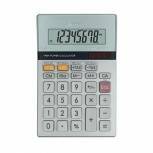 Professional, dual powered calculator with a durable metal facia, hard keys, decimal point selector, round up key, mark up key, 3 memory keys and auto power off. 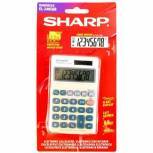 Sharp Silver 8-Digit Hand Held Pocket Calculator EL240SAB Pack of 1 Sharp Pocket Calculator - EL240S. 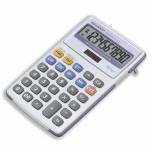 Handheld, 8-digit calculator with a large LCD display, plastic keys, dual powered, 3 key memory, large slanted display and last answer function. Dimensions - 71 x 116 x 165mm. 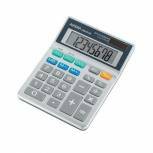 Sharp Silver 10-Digit Semi-Desktop Calculator EL-331ER Pack of 1 Semi-desktop calculator with 10 digit LCD display. Tax function. 4-key memory. Euro function. Tilt display. 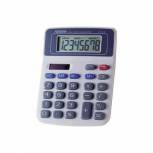 Q-Connect Silver Large 10-Digit Pocket Calculator KF01603 Pack of 1 Q-Connect Large Pocket 12 Digit Dual Powered Calculator with large easy to read display and rubber keys for ease of use. Dimensions - 116x69x6mm. 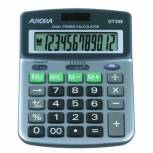 Aurora Grey/Black 12-Digit Desk Calculator DT303 Pack of 1 Aurora Heavy Duty 12 Digit Dual Powered Desktop Calculator with large keys and fixed angle display for easy viewing. Other features include Round up-down and decimal selector. DT303. Dimensions - 133x198x34mm. 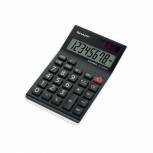 Sharp Black EL-124AT Desktop Calculator EL124ATWH Pack of 1 Sharp Black EL-124AT Desktop Calculator (Pk 1) EL124ATWH 12 digital large LCD display. Save time with tax buttons: +Tax/ - Tax. Easy totals with GT key. 4 key memory. Easy to read tilt display to minimize glare. 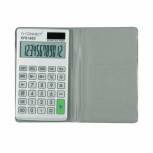 Casio 8-Digit Currency Calculator Silver MS-80VERII Pack of 1 Casio's currency calculator features currency conversion to aid transaction efficiency. It also features a clear 8-digit display to ensure clarity, as well as percentage calculation functions. 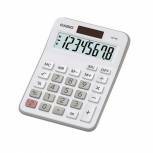 Sharp EL310AN Semi-Desk Calculator Pack of 1 EL310AN Semi-desk Calculator 8 Digit large LCD display. Slant display for easy viewing. Dual powered. Four key memory functions. Percentage key. Square root key. 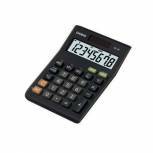 Aurora Grey/Black 12-Digit Semi-Desk Calculator DT661 Pack of 1 Aurora Multifunctional Calculator - DT661. 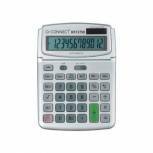 Durable, dual powered desk top calculator with a large 12-digit display, cost/sell/margin features, scroll facility, one touch tax feature and currency converter. 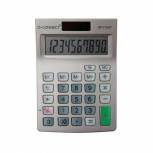 Sharp Silver 8-Digit Semi-Desktop Calculator EL-330ERB Pack of 1 Semi-desktop calculator with 8 digit LCD display. Tax function. 4-key memory. Euro function. Tilt display. 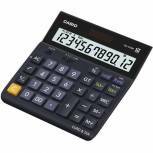 Casio 12 Digit Landscape Tax/Currency Calculator Black DH-12TER Pack of 1 Casio's Landscape Tax and Currency Calculator features a wider, more type-friendly design to increase speed of use. It also features relevant functions to calculate percentages and tax, including profit margins.